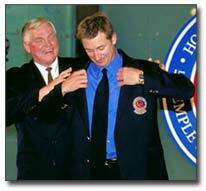 The Hockey Hall of Fame Board of Directors eliminated the right of the Selection Committee to waive the mandatory three-year waiting period for Induction in the Player Category (except under certain humanitarian circumstances) in 1999, after Wayne Gretzky received such an honour. 1947 - Dit Clapper retired on February 12, 1947. 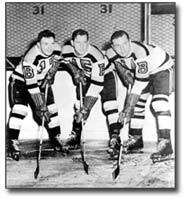 1961 - Maurice "Rocket" Richard retired following the 1960-61 season. 1966 - Ted Lindsay retired in 1965. 1969 - Leonard "Red" Kelly retired in 1967. 1971 - Terry Sawchuk passed away in Summer of '70. 1972 - Jean Beliveau retired in 1972. 1972 - Gordie Howe retired in 1972, came out of retirement in 1973. 1979 - Bobby Orr retired in 1979 due to knee injury. 1997 - Mario Lemieux retired in 1997, came out of retirement in 2000. 1999 - Wayne Gretzky retired in 1999. 1979 - Gordie Howe was inducted in 1972. 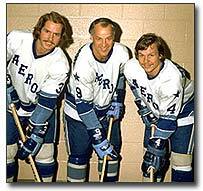 He came out of retirement for the 1973-74 WHA season to play alongside his two sons, Marty and Mark. Gordie was a two-time WHA FirstTeam All-Star and WHA MVP (1974) before returning to the NHL for one last season (1979-80) as a member of the Hartford Whalers. 1988 - Guy Lafleur was inducted in 1988. Guy played three additional seasons in the NHL, one with the Rangers and two with Nordiques, and tallied 52 goals over that period. 2000 - Mario Lemieux was inducted in 1997. Upon returning to the NHL, Mario won the Lester Patrick Trophy (2001), Olympic Gold Medal (2002), and averaged over one and a half points per game (more than any other player during that period). The Veteran Player Category was established in 1988 to provide a vehicle for players who may have been overlooked and whose chances for election would be limited when placed on the same ballot with contemporary players. Since its inception, 11 players have been elected in the Veteran Player Category, all of who are now deemed to be Honoured Members in the Player Category. On March 28, 2000, the Hockey Hall of Fame Board of Directors eliminated the Veteran Player Category. Hobey Baker (inducted in 1945) served as a US pilot during World War 1. He survived the War but crashed and died while testing a new plane on December 21, 1918 at the age of 26. Jack Darragh (inducted in 1962) succumbed to peritonitis in the summer of 1924 at the age of 33. Scotty Davidson (inducted in 1950) enlisted for military service after World War I broke out in 1914 and was killed in Belgium on June 6, 1915. Davidson was 25. Chuck Gardiner (inducted in 1945) died of a brain tumour at the height of his career on June 13, 1934 at the age of 29. Joe Hall (inducted in 1961) and almost all of his teammates fell ill during the 1919 Stanley Cup Final, with a number of them requiring hospitalization. Everyone recovered except for Hall who contracted pneumonia as a result of the flu and died in hospital on April 5, 1919. He was 37. Tim Horton (inducted in 1977) was killed in the morning of February 21, 1974, in a single-car crash while driving home to Buffalo after a game against Toronto in which he was named the game's third star. Horton was 44. Valeri Kharlamov (inducted in 2005) was killed, along with his wife, in a tragic car accident on the highway between St. Petersburg and Moscow on August 27, 1981. Kharlamov was 33 years of age. 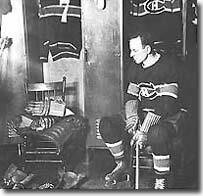 Howie Morenz (inducted in 1945) suffered a broken leg in a home game against the Black Hawks on January 28, 1937. It was generally agreed that the injury would end his career at the age of 34. 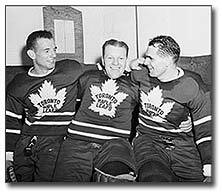 A few weeks later, on March 8, the hockey world was stunned by the news of Morenz's death, brought on by complications related to his injury. Terry Sawchuk (inducted in 1971) fell awkwardly on teammate Ron Stewart after some playful wrestling at a bar in New York. Sawchuk had to be rushed to hospital, where his gall bladder was removed, and just a month later he died from internal injuries at the age of 40. Hod Stuart (inducted in 1945) traveled to Brockville, Ontario in the early summer of 1907 to oversee the construction of the Belleville Drill Shed, a job his father's company was contracted for. During a break from work, Stuart suffered a fatal injury when he struck his head on rocks while diving into the unfamiliar waters at the Bay of Quinte. Georges Vezina (inducted in 1945) experienced great fatigue through training camp workouts prior to the 1925-26 season. Despite a high fever, he performed admirably in the Canadiens' season opener versus the Pittsburgh Pirates. Vezina eventually was forced to retire from the game after being diagnosed with advanced tuberculosis. He passed away on March 27, 1926 at the age of 39. On March 31, 2009, the Hockey Hall of Fame announced that its by-laws had been amended to establish a new voting procedure in the player category that allows for an annual limit applicable to female candidates given the consensus among the Board that female candidates ought not to compete with male candidates for limited places of Honoured Membership. 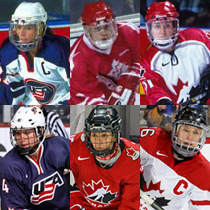 Since that time four female players have achieved Honoured Member status. 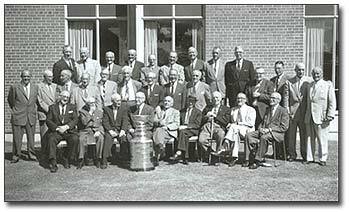 On Saturday, September 5, 1959, thirty-one of the thirty-four living members of the Hockey Hall of Fame attended a luncheon in the Queen Elizabeth Building at the CNE. Each was presented with the official HHOF crest.